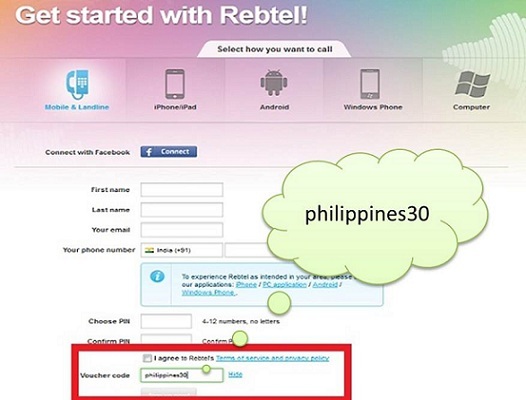 Rebtel Voucher Code to call Philippines For Free | Free Pc to Phone Calls, Free Voip Calls to India International ! So many people have asked us for a free calling packages for Philippines. Lots and lots of people on our Facebook Fan Page have requested for a voucher code (discount coupon) for calling Philippines. I understand that the call rates to this part of world are so high that your phone bills shoot up tremendously. The telecom industry has advanced so much (and the voip industry as well), but still if you check the call rates to Philippines, you will find that rates are in range of 10-15 cents (which we consider pretty high). That's like your one phone call (which easily lasts for 10 minutes or so) will cost you more than $1. With the aim to find our blog readers a good calling package, we mailed a few voip providers. We asked them if they can offer any special voucher code for calling Philippines. And yup, as usual Rebtel did us a favor. We have been very thankful for Rebtel (its the second largest voip provider in the world), as they keep us offering various codes and bonus offer. Infact if you remember, sometime last year Rebtel gave us one voucher for free calls to Philippines (it was a big hit on this blog). 1. Sign up with this special link. Please note that this offer is valid until April 30, 2010. If you like the Rebtel service (which I am sure you will), you may continue using Rebtel as they offer cheap rates to Philippines. You can call Philippines at just 10.9 cents per minute. Finally the question comes why you should choose Rebtel's service over other. - The list is long! This promotion is no longer valid and we understand that you still need to make calls to Philippines. You may end up paying huge phone bills. We found another offer which allows you to call Philippines from Mobiles for free. This is an offer by Air4. If you are looking for any cheap monthly unlimited calling plans for Philippines, then you can consider LocalPhone Package. They offer unlimited calls to landlines at about $40 per month. I won't say its the cheapest and best offer for you, but you can still consider it (as the Rebtel offer is no longer valid). That's because the offer has expired.